BEWARE of getting a transmission flush on a high-mileage vehicle!! Actually, just don't get a transmission flush at all no matter what your mileage is!! At the beginning of May we were under a lot of stress. Our house had flooded and we were living in a hotel. My aunt had just passed away unexpectedly and we were trying to figure out how I could get to the funeral. At one point, I was going to drive the van over to Louisiana by myself. Stuart didn't really like the idea but the van was in pretty good condition so he wasn't too worried about me getting stranded on the side of the road. I decided to go to our local Kwik Kar Lube and Tune for an oil change just to be sure everything was in tip-top shape. The oil change was completed then the service guy came in and said that based on the mileage of the van, I should get a transmission flush. He reminded me that they had recommended this to me at my last visit and we turned it down. I seemed to recall Stuart saying something last time about transmission flushes not really being necessary and even causing more damage. I gave him a call at work. I felt bad bothering him at work because I know he had been under stress getting his work done lately with all of the distractions, phone calls, and meetings about the house repair. He seemed hesitant at first about approving the transmission flush. Although I didn't tell him this, I really wanted to do the transmission flush so I could be sure that everything possible was up to date on the van so there would be no problems show up while I was on the road alone. I don't know if he picked up on this from my tone or if he just let the stress of everything cloud his better judgment but he agreed to have them do the transmission flush. So we paid Kwik Kar $188 that day. Although that was a lot of money, I felt good knowing I was taking good care of the van. All was fine for a while. A couple of weeks ago I felt a sluggish feeling with the gears shifting but figured it was just a fluke or maybe some crummy gasoline I had gotten. But then the problem continued to get worse. We started having more frequent problems with the van not shifting gears, typically around 40 mph. We could let off the gas and try again and usually the problem just seemed to fix itself. Unfortunately, earlier this week I was on my way home from running errands with the kids and the van just couldn't seem to make it above 40 mph without sounding like the engine was going crazy. The motor was revving at 3000 - 3500 when it should have been kicked back down to around 1500. It just couldn't shift to the next gear. I was thankful that I had not just pulled on to the interstate and tried to merge into traffic when this happened because we could have likely gotten rear-ended. I stayed on the small roads and made it back home but the van never seemed to be able to shift gears correctly the whole way there. At home I realized that the dashboard "malfunction indicator" light had turned on. I looked it up and it means that there is an engine or automatic transmission problem. Well, duh! We ended up taking the van to a transmission shop yesterday. 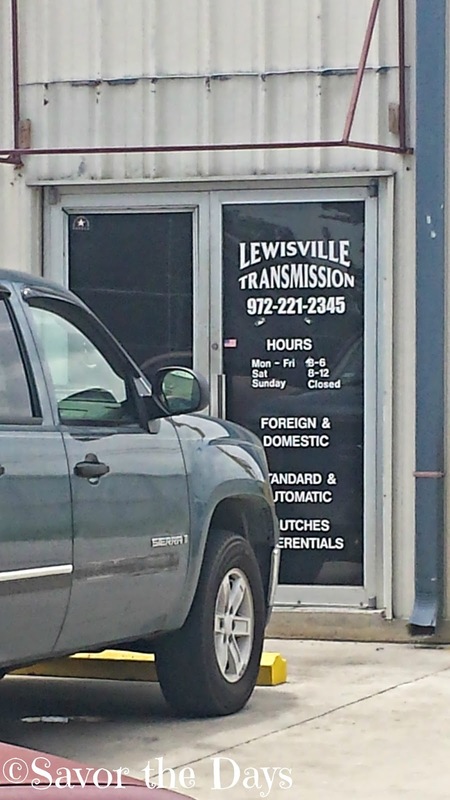 We had to take a previous vehicle here one time and the new transmission cost something like $3000. I've prayed a lot since yesterday. The shop just called Stuart and told him that they have researched the error codes on the van and found multiple problems. Most importantly is the fact that the problem lie within the transmission and not just a control panel or some easy (inexpensive) fix. They can rebuild the transmission for about $1800 (and that is including a "return customer discount"). He told Stuart that there was a lot of debris that had been knocked loose from the transmission flush and it had clogged up important valves. Although the transmission fluid looked like it had been replaced it was now burnt because of the damage that had been done. We have done research this week and learned that real mechanics never recommend transmission flushes on high mileage vehicles for this very reason. The flush will clean off lots of gunk but that gunk has no where to go so it just flows through the system until it gets stuck somewhere else, typically clogging things up. As long as the transmission is working properly it is better to just leave the gunk stuck where it is. Should we have had the transmission flush done earlier to prevent the gunk from ever building up? No. Our vehicle manual's recommended maintenance schedule never recommends doing a transmission flush for any mileage for normal driving conditions. So why did Kwik Kar recommend it to us multiple times? Just looking to make a buck? Or are they just really bad mechanics? I don't know but they are surely not a business that I can trust with my vehicle ever again. Rachel Lost Her First Tooth!